On Saturday March 24 we had the pleasure to host a group of 40 Porsche Carrera: 997, 996, 993, 964, GT3, Turbo, Cabrio, Targa, .... what a sound when they arrived ! After an in depth tour to both the vineyards and the winery, we went to a nearby trattoria where we had the traditional Pappardelle al cinghiale. Dròmos showed beautfully and everybody was impressed by our great passion and efforts behind it. 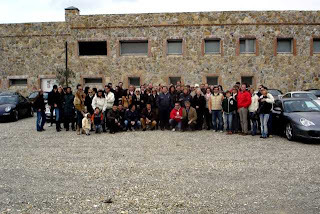 I am sure that now we have 80 new Ambassadors who will help us in making Dròmos more and more known and appreciated.